The light Minigiogali is a really admirable dining table light. The tender design by Angelo Mangiarotti is hand-made by the manufacturer Vistosi and is available in different colours. 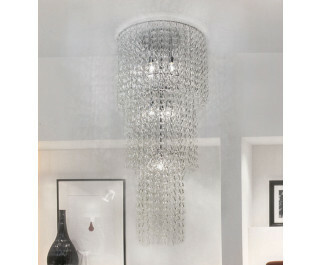 The chrome structure harmonizes perfectly to the elements of crystal glass. Please, also have a look at the whole series of Giogali and Minigiogali and find your personal favorite.